Delicious juicy and tender baked chicken. Fresh lemons, garlic, rosemary and thyme. Seasoned and coated with a butter-herb sauce and baked to perfection. I originally posted this recipe back in September, 2015. WOW!? Has it really been that long? This is the easiest meal of all time! Simple ingredients kind of easy. 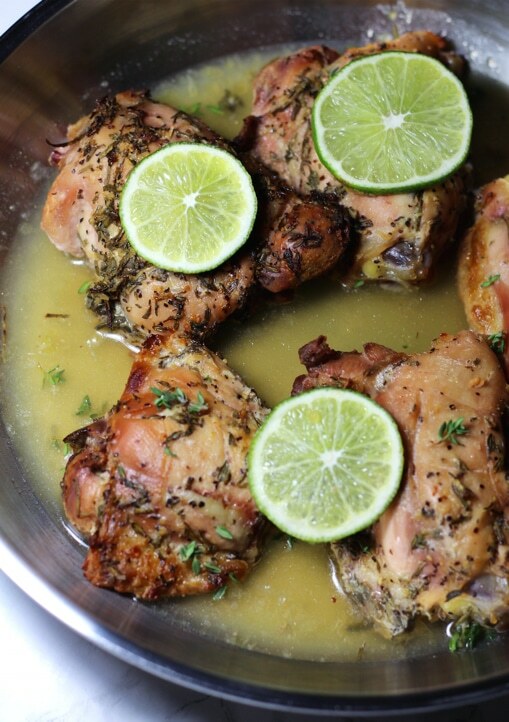 So, I decided to dust this Lemon Thyme Chicken off and bring it back to the top of the food blog! I’m a food blogger. I’ve been know to make some DELICIOUS chicken recipes, like my Lemon Butter Chicken…ok everyone loves this chicken recipe. Ok, it’s true – I do make a lot of chicken recipes. But ya’ll… chicken is CRAZY versatile. Do you know how many recipe variations you can create with chicken?!? A ton. And hubby likes chicken. It’s a no-brainer win-win situation. I feed the man what he loves. But here’s my number one struggle with my son’s statement. Every time he asks what we are having for dinner and I say chicken, he rolls his eyes, slumps into his chair and says, “ugh mom, come on…chicken again? !” I then put the plate in front of him, he takes a bite and he’s like, “OMG mom, this is delicious!” Every. Single. Chicken. Recipe. Recipe worth repeating over and over and over again…that is THIS recipe. Juicy, tender and full of lip smackin flavor! If you like lemon chicken recipes, you’re going to love this bad boy. Because it’s lemony! Is that a word? Let’s talk ingredients so you know what you’re getting yourself into. SIMPLE INGREDIENTS. Did you catch the word “fresh” in the list of ingredients? Everything about this recipe is fresh. First, we need to make the marinade because that’s what makes this recipe POP!. The marinating process is absolutely essential…I HIGHLY recommend you don’t skip this step. What you’ll need to do first is place lemon juice, lemon zest, garlic, thyme, rosemary, salt and pepper in a small bowl. Whisk to combine. Next, take the tip of a sharp knife and cut into each chicken piece 2 to 3 times, about 1/2 an inch wide and thick. This helps the marinade really get in and penetrate that chicken. OH flavor…I SO need you to be there! My son needs the flavor to be there! Because it’s another chicken recipe. Yeah for this method because this is the step that brings…FLAVOR TO THE DINNER TABLE! Ok, now we need to marinate this Lemon Thyme Chicken overnight. You’re going to place the chicken pieces and the marinade in a gallon size freezer bag. Rotate bag so all chicken pieces are coated with the marinade. Seal that bag and place in the refrigerator overnight. After the chicken thighs have marinated, preheat the oven to 425 degrees. Take that chicken from the marinade and place in a single layer in a large baking dish. I use a 9×13 glass pyrex dish. Use a pastry brush to brush a small amount of melted butter on top of each piece of chicken. You’re going to bake the Lemon Thyme Chicken for 45 to 50 minutes, or until the chicken is cooked through. Once done, take the remaining melted butter and brush on top of thighs and let rest for about 5 minutes before serving. Don’t skip the marination process! Cut those slits in the chicken and let that marinade penetrate! The secret to this recipe is slicing the chicken both vertically and horizontally so the marinade can seep in. I let these marinate overnight so the chicken would be full of flavor. You can use any type of chicken you like with this recipe. In these shots, I used boneless skinless chicken thighs. I’ve also used bone in thighs and drumsticks for this recipe. When it comes to bone in chicken thighs, I feel they are juicier with the bone. I didn’t photo any drumsticks because the kiddos ate them all before I could get the pictures done…yep I’m telling you, this recipe is that good. The kids ate ALL the drumsticks. Gone. No more. No leftovers. I’d say this recipe passed the kid test! There are 2 ways you can make this chicken…with fresh herbs or with ground herbs. I typically always push fresh ingredients, but this recipe turned out great with both fresh herbs and with ground herbs. You can taste the difference in each version, but both are fantastic! 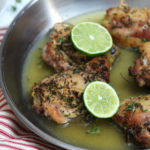 I love to top this chicken with with a lemon or lime slice! I love all the citrus! 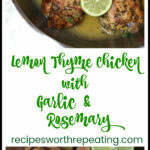 What to Serve with Lemon Thyme Chicken with Garlic and Rosemary? Did you find this blog post and these step-by-step instructions helpful? If you’ve tried my Lemon Thyme Chicken with Garlic and Rosemary or any other recipe on the blog then don’t forget to rate the recipe and let me know how it turned out in the comments below! I love hearing from you! You can also sign up for my newsletter and FOLLOW ME on FACEBOOK, TWITTER, INSTAGRAM and PINTEREST to see more delicious food I’m creating! Juicy and tender baked chicken. Fresh lemons, garlic, rosemary and thyme. Seasoned and coated with a butter-herb sauce and baked to perfection. You have the option to cook the chicken with the skin on or off. I personally like it with the skin off, so before I started prepping, I removed the skin to the chicken thighs. I left the skin on the drumsticks. Place lemon juice, lemon zest, garlic, thyme, rosemary, salt and pepper in a small bowl. Whisk to combine. With the tip of a sharp knife, cut into each chicken piece 2 to 3 times, about 1/2 an inch. This helps the marinade really get in and penetrate. Place the chicken pieces and the marinade in a gallon size freezer bag. Rotate bag so all chicken pieces are coated with the marinade. Seal the bag and place in a bowl in the refrigerator overnight. After the chicken has marinated, preheat oven to 425 degrees. Remove the chicken from the marinade and place in a single layer in a large baking dish. Use a pastry brush to brush a small amount of melted butter on top of each piece of chicken. Bake for 45 to 50 minutes, or until the chicken is cooked through. Thighs need to be at 175 degrees to be considered done. Once done, take remaining melted butter and brush on top of thighs and drumsticks and let rest for about 5 minutes before serving. Update Notes: This post was originally published in September of 2015, but was republished with an updated step-by-step instructions, pictures and tips in August of 2018. Lemon and thyme are just the best buddies! This chicken looks so tender, juicy and delicious! I can see why your son proclaimed you the “best cooker!” The brightness from the citrus and the savory herbs makes this an instant family favorite. Classic flavors for chicken and yes, worth making over and over again. I think that marinating the chicken is a great idea, that would give it so much flavor. HAHAHA kids!!!! You just can’t win. But you’re right. Chicken is crazy versitile so I never get sick of it! This looks like a great family meal. I know my son would love this as he loves garlic and chicken! Is there a way to use a quick pot to do this recipe. I have not tried making this in an Instant Pot or a One Pot but that’s a great idea!! I bet it would taste amazing! I’ll try it on my end but if you do it on your end let me know how it turns out! !